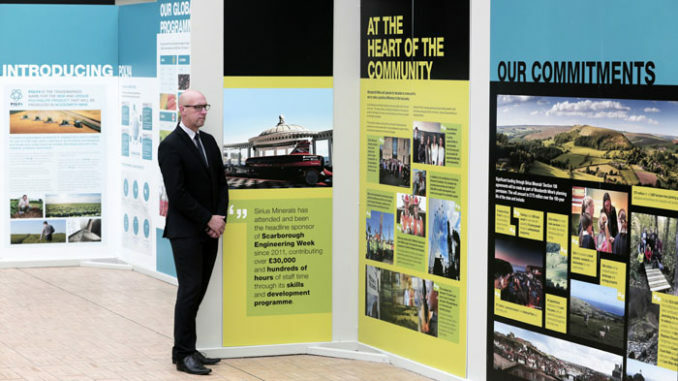 A major mining project that will bring thousands of jobs to the region is being outlined at a new exhibition at Kirkleatham Museum. Sirius Minerals’ multi-million pound project involves the construction of two deep mineshafts south of Whitby to access a deposit of a mineral called polyhalite, a key ingredient in fertiliser. The mine shafts connect to a 23-mile tunnel to transport the mineral via conveyor belt to Teesside, where it will be processed and shipped around the world. Construction of the mine began last year and is due to enter production in 2021, creating up to 2,500 jobs, £2.5bn of exports and a fertiliser product which will help farmers around the world increase crop yields to feed a growing global population. The exhibition, entitled ‘From Woodsmith to the World: The Story of Sirius Minerals’ Polyhalite Project’, opened on Saturday at Kirkleatham Museum and will explore the design, construction and operation of a new mine and processing plant. It will run until Wednesday July 11. Councillor Carl Quartermain, Cabinet Member for Culture, Tourism and Communications at Redcar & Cleveland Borough Council said: “We know there is a huge local interest in the Sirius Minerals’ project due to the jobs and investment the project will create. “Just this week a Sirius Minerals’ recruitment event in Skinningrove exceeded all expectations when more than 400 people attended, all eager to find out about job opportunities with this global company. Matt Parsons, external affairs general manager for Sirius, said: “There has been a significant amount of interest generated in the area by our project. A Sirius Minerals’ recruitment event was held at the East Cleveland Training Employment Hub at Skinningrove for local people to find out about job opportunities during the construction phase of the polyhalite project. Expected to attract around 150 people, the event organisers were thrilled when 435 people arrived, prompting Sirius’ Matt Parsons to deliver his presentation outside to the waiting crowd.